Bon jour! This is Libby. 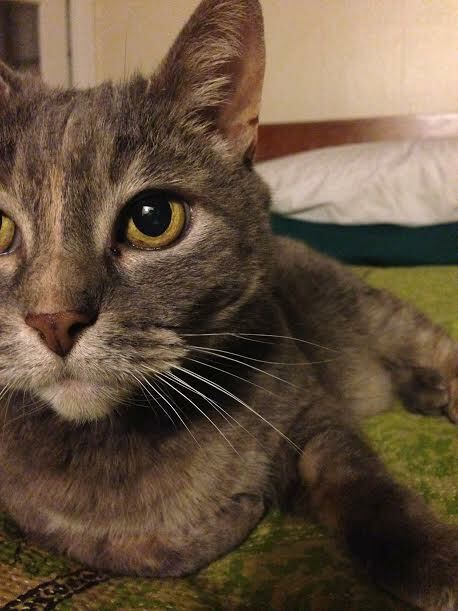 She is an adult cat who is healthy, happy, and very affectionate once she gets to know you. She is a lover and a cuddler. Libby is micro-chipped, spayed, and has all her shots. She is an indoor/outdoor cat but she doesn’t mind being an indoor cat. She enjoys catnip as a special treat. Also she loves playing and chasing after elastic hair-ties. Libby will sleep with you on your bed, or if you’d like more space she doesn’t mind sleeping in another place. She loves to be pet on her head and scratched on her chin. Libby is a nuzzler and a purring machine! Libby is timid when she first meets people and other animals but she does warm up to them after a little time. Libby comes with a litter box, litter, kibble, a few brushes, and a wicker cat nook she enjoys. Thank you for reading about Libby. If you have any questions, please do not hesitate to contact Kelly at kelly.cowgill@gmail.com for more information.